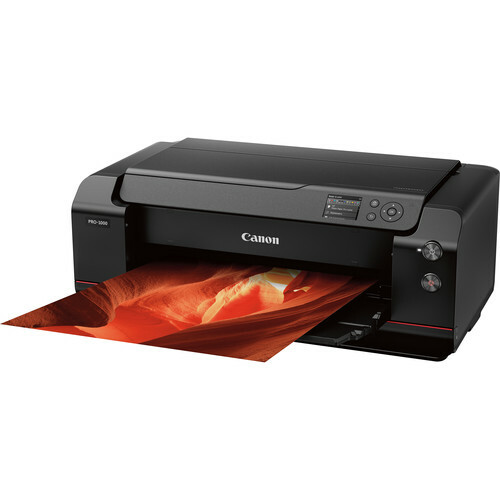 We introduce the Canon imagePROGRAF PRO-1000 - a 17" wide format professional printer with an 11-colour plus Chroma Optimiser ink system that does it all. Print striking, borderless images up to A2 on a variety of media types (gloss, matte, fine art papers and canvas) without compromising quality. 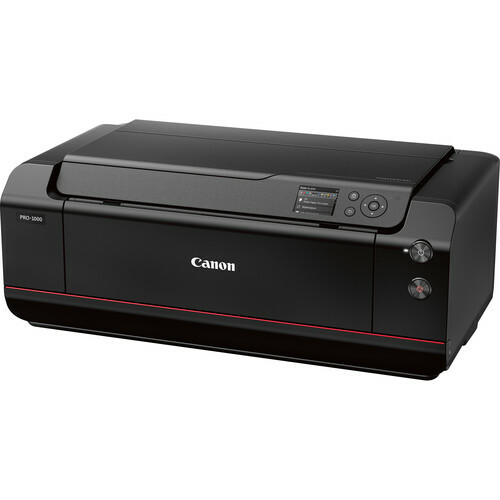 its fast print speed and colour accuracy makes this printers a pleasure to own. Smarter nozzles: Engineered with 18,432 nozzles and sensors that continuously monitor status and deliver optimum results. Air feeding system: A series of openings located on top of the platen vacuum-grip the paper as it feeds through the printer. Skew correction: Skew Correction function guarantees that all types of paper, including thick fine art type papers, can be fed without the need for reprints. The LUCIA PRO 11-colour plus Chroma Optimizer ink system satisfies the demands of the most critical photographer or graphic artist. Denser droplet placement provides a broader colour gamut and improved gloss uniformity for superb glossiness and anti-bronzing. Incredibly accurate colour reproduction, outstanding image clarity, and enhanced detail in darker areas distinguish each print. On fine art papers, higher black density renders even the finest shadow detail, for a print that becomes a work of art. 11-ink system plus chroma optimiser: Utilising new pigment ink with modified compositions and new colours, LUCIA PRO INKS have enabled a broader colour gamut and greater shadow detail reproduction in dark areas. Increased density of ink on the paper improves colour gamut. Even light reflection contributes to improved glossiness and image clarity. Contributes to anti-bronzing on glossy paper. Core technologies: The print head, ink and image processing engine mounted on the imagePROGRAF PRO-1000 provide high levels of image quality and productivity. 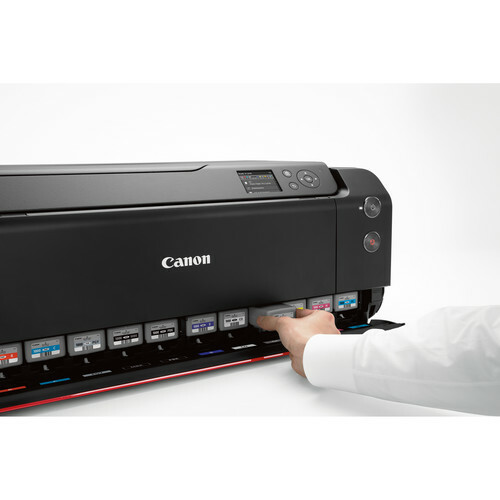 A new ink system adopts 11-colour inks and Chroma Optimizer ink. 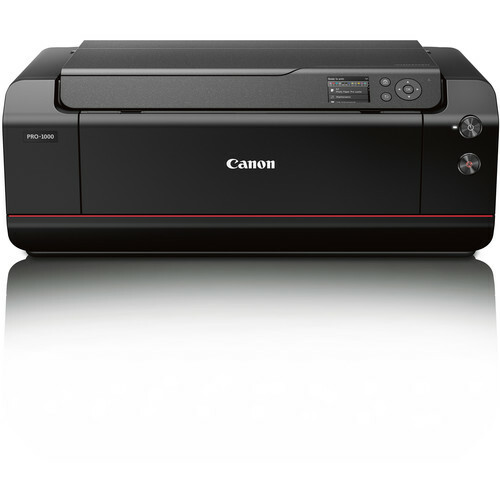 This system helps you achieve an improvement in colour-reproduction, image clarity, and enhanced darker areas. It faithfully reproduces colours and dark areas crucial for printing works of art. The newly formulated blue and magenta inks will help recreate the finest details when printing nightscapes and sunsets. ContrastCONTRASTThe difference between areas of different brightness levels in a photograph: A high-contrast image has a greater difference between light and dark areas, whereas a low-contrast image has a narrow range of tones. Contrast is used to direct a viewer’s attention to a photographer’s subject either with colour contrast (bold versus duller colours) or tonal contrast (bright versus darker tones). reproduction: By using this function in combination with the Digital Lens Optimizer included in Digital Photo Professional, you can print sharp, high-definition images without losing any of the qualities present when the image was photographed. Soft proofing: Allows for visual proofing of the final print, taking into account for colour reproduction for a specific paper type. Improved UI: Enjoy intuitive operation and settings such as Favorites, History, and several colour Adjustment Functions. Seamless integration: Seamlessly works with leading image editing software programs. 16-bit workflow: Allows for 16-bit processing of images to dramatically improve your final output. 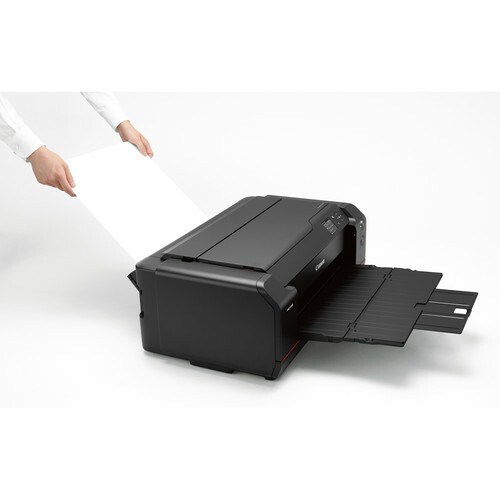 Quick utility tool box: Provides quick access to all the Printer Management Tools. Media configuration tool: Enables complete customisation of the media menu in both the driver and the printer by re-arranging paper types, hiding unused media, and even creating a custom set of printer parameters for your preferred media. Adjustments such as print head height and vacuum strength can be manually entered and saved. Accounting manager: Account for every sheet of paper and the amount of ink that was used. Accounting Manager allows you to accurately assign and track the costs of every single job. Device management console: The Device Management Console allows you to manage multiple printers, all in one convenient place. 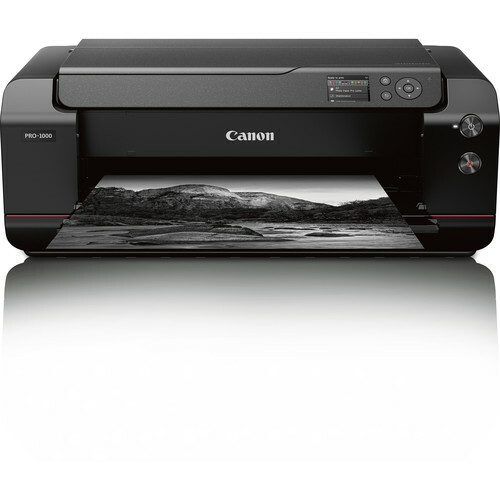 Monitor, control and calibrate imagePROGRAF PRO-1000 printers regardless of location to ensure the consistency that you demand from your printers. Colour calibration tool: The colour Calibration Tool enables you to ensure the quality of each and every one of your prints, regardless of which imagePROGRAF PRO-1000 in your studio you are printing on.